As the capital city of Norway, Oslo is the hub of Norwegian trade, government, banking, industry and shipping. 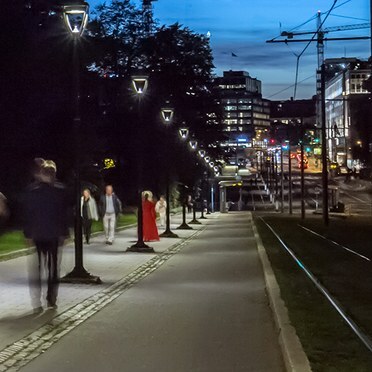 Oslo has been ranked number one in terms of quality of life and is among the 39 signatory cities to the LUCI Charter on Urban Lighting. The LUCI Charter aims to promote a culture of sustainability by considering factors including maintenance, recycling, light pollution, energy efficiency and quality of life. 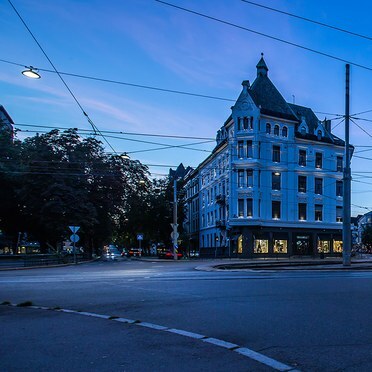 The City of Oslo is a long-term Thorn customer and in 2014 Thorn won a public tender to replace its mainly 80/125/250W mercury fittings and closed protocol city controls for street lighting. 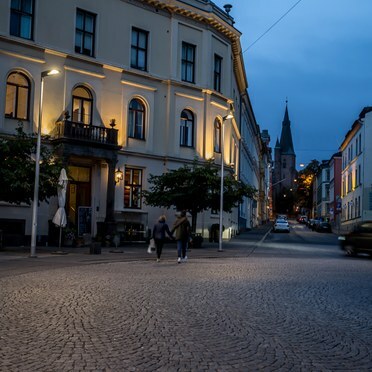 The City of Oslo wanted a smart lighting solution using luminaires, control devices and a city lighting management system that would work with recognised and open protocols. The key objectives for the project were to firstly improve road and public area safety, secondly to achieve energy savings using new technology and controls and thirdly, to limit obtrusive lighting while maintaining a classic decorative design for some fittings. 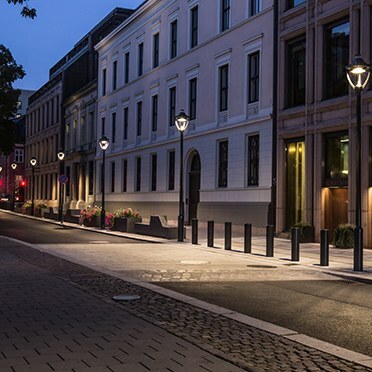 Rather than going for a 5 lux or less average requirement in residential areas, Oslo wanted MEW4 class lighting according to EN 13201, which also covers uniformity on wet roads and threshold increment glare evaluation. A total of more than 4,000 Thorn Legend, Thor, Urba and R2L2 street lanterns have been installed across the city. For the city centre’s pedestrianised and mixed traffic areas, Thorn’s modern heritage post-top/suspended LED Legend lantern is providing high performance decorative lighting. For other central street areas, including in between buildings, Thor is being used with suspended/catenary installation. Thor is a smart LED lantern offering easy integration of connectivity and sensors into city environments. Using traffic management data, Thor automatically adapts lux levels according to density and standards. Combined with Thorn’s high performance R-PEC optic, it provides quality lighting which balances both performance and comfort. Finally, R2L2 is installed across residential and less populated areas outside the city centre. R2L2 is a complete road lantern family at the forefront of LED technology to offer excellent lighting performance. Also fitted with the R-PEC optic, R2L2 offers 12 types of light distribution for precise light placement with no waste light. For effective lighting control and maximum comfort and energy savings, all lanterns benefit from SL21 Lon Works nodes from Citylone. High quality lighting appropriate for use and conditions helps to promote improved safety with better visibility across the city. By adopting MEW4 class lighting according to EN 13201 there always is enough light to improve safety while full dimming controls ensure there is no over-lighting either. Light levels are based on the time of day and knowledge of traffic density or activity in each part of the city, across 750 connected areas. Importantly, energy efficient LEDs help to improve efficiency between 30 and 80%, depending on dimming levels. This creates a win-win situation with better lighting levels than before and reduced energy consumption. Additional controls are also planned for events or busier times such as on a Friday or Saturday evening. Comfort for users and residents is another key benefit. With no uplight, Legend in particular effectively controls obtrusive light to create a comfortable environment. To soften the light impression Thor additionally has a very large luminous area.